Pharmacists have seen their industry evolve in many ways over the past 30+ years. It has become more than a profession which accurately dispenses medication to patients with a valid prescription. The modern pharmacy has become a one-stop shop for multiple healthcare needs. As a pharmacist, you assist other healthcare professionals by providing needed products which meet individualized treatment plan goals. You’ll also be joining a family which began to serve communities with needed medication as far back as the 20th century BC. There is evidence on cuneiform tablets that recorded prescribed medicine for people to treat their needs. If you’re thinking about a new career, or you’re exploring what you might like to go to school for one day, then here are the pros and cons of becoming a pharmacist to think about. 1. You’re going to be compensated well in this career. Once you have graduated with your PharmD degree, there is an excellent chance that you’ll be earning six figures in the near future. Many entry-level positions as a pharmacist begin at more than $100,000 per year. In the United States, the median salary for this career is over $120,000. Even the lowest 10% of earners within the industry are making more than $87,000 per year. There are very few career options which allow you to earn that right out of the gate. The gender pay gap as a pharmacist is also one of the lowest of any professions in the United States. A 2014 study by Harvard found that being a pharmacist was the most egalitarian of professions in the medical industry today. 2. There are a wide variety of job opportunities available to pharmacists. You’ll discover that there are two primary industries that a pharmacist serves: the hospital industry and the retail industry. A majority of the job opportunities which are available in each community are located in one setting or the other. You will also find, however, that pharmacists may perform different roles, or hold different responsibilities, within each setting. As a pharmacist, you can work in ambulatory care. You could become an academic pharmacist to teach others the skills which are required. Compounding pharmacists create drugs which meet special patient needs. You can even work as a consultant, in long-term care, or with infectious disease. The options are plentiful. 3. You’re not required to hold a license for all pharmacy positions. If you decide that up to 8 years of schooling is not right for you, but it is your destiny to work in a pharmacy, then there are still some positions to consider. You’re not required to be a licensed pharmacist to become a medical writer. You can work in the pharmaceutical industry without a license if you’re not responsible for the final distribution of medication to patients. 4. You might have the option to work from home. As online healthcare options continue growing, there are more opportunities available for pharmacists to consult from home. Telepharmacy is growing rapidly in the U.S. healthcare industry, with the Veterans Administration taking a lead role in the development of this segment. Although the job duties in telepharmacy are essentially the same as the would be in other positions, you won’t face the same physical demands that are placed on those who work in an actual pharmacy. That means there is the potential for more time with your family, less commuting, and access to that high wage which attracts people to this industry in the first place. 5. Work is available everywhere as a pharmacist. Once you earn your PharmD degree, you have the option to live and work almost anywhere you want. Pharmacists are required in every part of the world to provide medication services. In the United States, there are varying requirements for licensure that must be met based on the state where you choose to live. In Alabama, you must register with the Board of Pharmacy and that is the only requirement for work. California requires you to complete a training program with a minimum of 240 hours of training, earn an associate degree, complete a military training program, or become nationally certified in some way. As for Colorado, there are no licensure requirements. 6. Self-employment is an option within this career. As a licensed pharmacist, you have the option to work for someone else or work for yourself. Although the number of independently-owned pharmacies are not as high as they once were, you can still find them in small communities, rural locations, and other pockets of need. According to the National Community Pharmacists’ Association, there are over 21,000 small businesses operating in the United States, with 1,800 rural independent pharmacies being the only provider for their community. The economic impact of the self-employed pharmacist cannot be overstated. Over 240,000 jobs in the United States (both full-time and part-time) are available each year because pharmacists open an independent location. Over 30% of all retail prescriptions are fulfilled by independent pharmacists. 7. You have a choice of available shifts when working as a pharmacist. It would be fair to say that a majority of the positions available within this industry tend to offer 12-hour shifts. You’re either working during the day shift or working the overnight shift. The other positions, especially in retail, offer some added variety. There are pharmacists who work a first-shift schedule, a second-shift schedule, and some work overnight shifts. You will have the option to work either full-time or part-time, depending on what your personal needs happen to be. Because you hold the pharmD degree, it is easier to create a job which works around your life instead of needing to manage your life around your job. 8. The occupational outlook for pharmacists is strong. 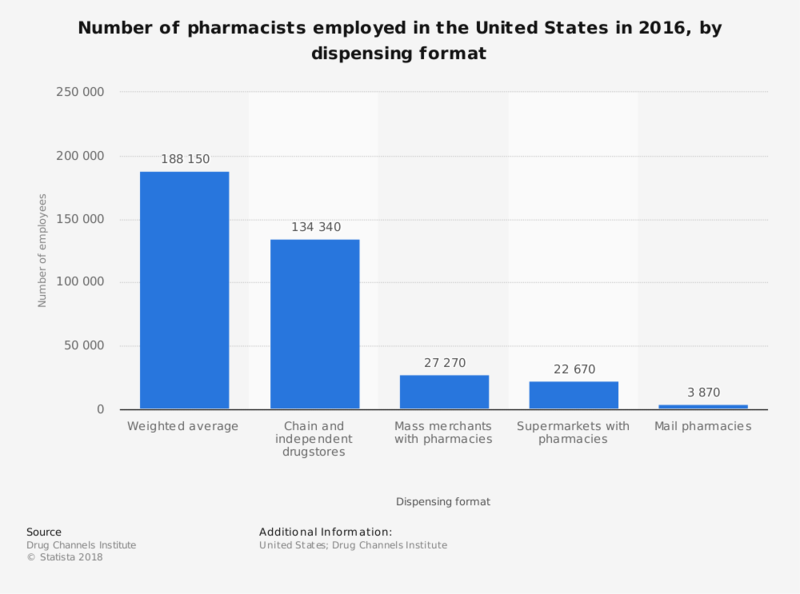 According to the Bureau of Labor Statistics, the employment of pharmacists in the United States is expected to grow at a rate of 6% through the year 2026. That is about as fast as the average for all occupations. The BLS also expects an increased demand for prescription medications, which means there will be a higher demand for services that are provided by the pharmaceutical industry. At this moment, there are more than 312,000 pharmacists currently employed in the United States. With the anticipated job growth noted above, another 17,000 positions are expected to be added in the coming years. 9. Pharmacists are being given even more authority to care for patients. In 2013, California legislation SB493 was signed into law. It went into effect in January 2014. Called the “Pharmacist Provider Status Bill,” the law changed how pharmacy care was administered in the state. This legislation provided pharmacists with provider status, giving them the authority to make patient assessments, refer to specialists, and prescribe medication through collaborative drug therapy with proper training. Pharmacies are now authorized in many states to administer specific vaccines to patients, such as the flu shot or the shingles vaccine. Additional services are being provided as well at the community level in some areas to create more healthcare access for people. 10. It doesn’t take much time to start your own pharmacy. According to McKesson, you could start a new independently-owned pharmacy in just six months. They also estimate that you would only need to operate between 7 to 9 months to see a positive cash flow. If you wish to own a business or be self-employed as a pharmacist, you’ll find that this opportunity is one of the best which is available today to create a comfortable lifestyle for yourself. Although the cost of starting a pharmacy from scratch may be daunting for some (estimated to be up to $450,000), the near surety of a positive cash flow creates affordable financing opportunities for pharmacists who are willing to take a small risk. 11. Job stability is impressively high within this profession. As a pharmacist, you are a valuable member of your community. No matter what segment of the industry you decide to pursue, there is a good chance you’ll stay employed until you are ready for your next opportunity. Unlike most careers, you are always needed in the community you serve. And, on the off chance that enough people move away that a local pharmacist is no longer required, you can move just about anywhere with your pharmD degree and find another job with an equivalent pay and benefits package. 1. The education requirements are extensive. When you earn a PharmD degree, then you’ve earned the equivalent to a doctorate degree for most people. It requires about 6 to 8 years of education and training before you can meet the educational requirements necessary to serve your community as a pharmacist. Through that time, you’ll be looking at metabolic pathways, chemical structures, drug side effects, and much more. Every exam brings with it the pressure to succeed. That process can be daunting for many students who are looking at this career option. 2. There is the cost to consider as well. In 2014, the average person graduating with their PharmD degree held over $100,000 in student loan debt. Although you can mitigate some of that cost with scholarships and grants, you’ll find that the price for pursuing this career path is quite high. Once you start earning a strong salary, that debt will begin to go away, but it may be difficult for some students to afford the cost of their tuition. 3. You are responsible for multiple layers of safety as a pharmacist. Pharmacists are required to ensure the safety of the medication given to each patient. They must review the quality and efficacy of each order, ensuring that what is handed to the customer is suitable for their condition which must be treated. Pharmacists offer instructions on how to take medicine properly, answer questions, and have a long list of responsibilities that include corporate mandates. The bottom line is this: as a pharmacist, the lives of customers are in your hands. 4. The hours of a pharmacist are not always kind. Hospitals with a pharmacy are open 24/7 without exception. That includes holidays. In that type of job, you are going to be busy from the start of your shift until you head home for the evening. Many pharmacists work 12-hour shifts, handle ICU patients, and must handle a lot of stress. There is also the retail side of being a pharmacist to consider. You must understand insurance programs, know proper billing procedures, and work with customers who could be unpredictable. 5. There is a lot of competition within this industry. It wasn’t that long ago when you could work as a pharmacist with only a 4-year degree in the subject matter. Now you have a doctorate equivalency and a residency to complete before your career gets moving. Once you are accepted into a pharmacy program, you must graduate to pursue your career. You’re not guaranteed a position after you graduate either. If you do find work, it may not meet your salary expectations. Only the best in each program tend to get the best jobs in this industry, while everyone else works long hours to pursue their passions. 6. Healthcare is always an uncertain industry. When the Affordable Care Act was passed, the changes which came with it caused some hospitals and medical facilities to close. That meant pharmacists lost their jobs. Even though every community needs a good pharmacist to serve their needs, you are not guaranteed your position – even after you get a job. Not even those who work in the retail industry are 100% safe from the shifting landscapes of the healthcare world in the United States. You may wish to have a backup plan in place just in case your pursuit of becoming a pharmacist doesn’t quite meet your expectations. 7. Pharmacists handle problems all of the time. Because of the nature of this job, people are going to come to you whenever they have a problem which needs to be solved. You’re going to be answering questions from customers, patients, and even healthcare professionals. Most people are nice, handling these conversations in a professional manner. You’re also forced to deal with people who woke up on the wrong side of the bed that morning. Every career exposes you to the best of humanity – and the worst of humanity – but as a pharmacist, you’ll be seeing people when they’re sick and having a bad day all the time. 8. You will find yourself standing a lot in this profession. There are several professions which require you to be on your feet throughout the day. As a pharmacist (especially in the retail segment), you will be standing throughout most of your shift each day. You’ll be reaching up and down your shelves to stock medication or fill prescriptions. It is a career option which is surprisingly demanding with its physical requirements. There are even locations where you cannot take a break to use the bathroom because you’d be forced to shut down the pharmacy while you were gone. 9. People don’t understand the complexities of the profession. Pharmacists often see people who think of them as nothing more than a “pill counter.” They think that your work in this profession involves reading a prescription, finding the pills, then counting them out accurately. They don’t understand the extent of the training that is required, the years of study you had to go through, and how qualified you are to provide professional advice for their health. 10. You must always be at your best as a pharmacist. When you enter into this career, you will find that there are no second chances. Accidentally giving the wrong drug to someone could result in serious medical consequences for that person. Even an incorrect dosage could mean the difference between life and death. If you do make a mistake, the consequences are often swift and severe. You could face a large fine, or even jail time, depending upon the outcome of the situation. Retail pharmacists are especially vulnerable with this disadvantage. There is a high volume of patients which come to the pharmacy counter each day that must be served. At best, you may only have a couple of minutes to counsel each person. It is a structure which increases the risk of a liability issue occurring. 11. The employee benefits offered are average compared to other healthcare professions. Like most jobs, an employed pharmacist will receive some type of health insurance which covers medical, dental, and vision in some way. Retirement benefits are usually provided in the form of a 401k. You’re given paid time off, some education assistance, and maybe an employee discount. The generous portion of the compensation package in this industry is the salary you’re able to earn. 12. There are relatively few opportunities for advancement. Once you become a licensed pharmacist, that’s going to be your job. You’re already at the top of the hierarchy. For people who are ambitious or want to keep earning a higher salary, a position as a pharmacist may not be right for them. 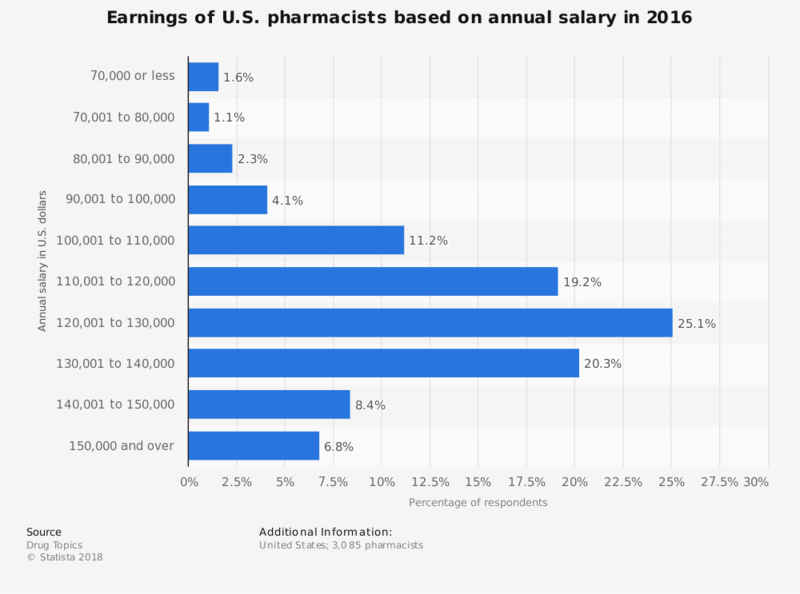 Even the most experienced pharmacists average about 40% more in wages than entry-level positions, which is a difference of $40,000 per year. These pros and cons of becoming a pharmacist show that with hard work, dedication to the process, and a willingness to succeed, you can earn your way into a high-paying job that is incredibly rewarding. Although there are some pitfalls you may experience along the way, many pharmacists find that once they start working in this field, there is nothing else they’d rather be doing.